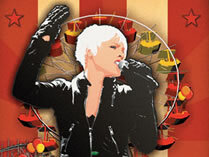 June 2010 sees P!nk bringing her Funhouse Tour to the Alton Towers Resort. P!ink's musical extravaganza has already sold an incredible 2 million tickets worldwide and has proved so popular that more dates have been added to the tour. Hosted at six open-air venues across the UK, including the Alton Towers Resort on Sunday 27th June 2010. Her astonishing and record-breaking Funhouse Tour will be transformed into a Carnival-style spectacular with a visually stunning new production. The Carnival will, without doubt leave hundreds of thousands of fans across the UK stunned with P!nk's special brand of high octane and dazzling performance. In a departure from recent concerts which have been held in the car park area, P!nk's Funhouse Summer Carnival will take place on the front lawns of Alton Towers, a truly unique setting with the Gothic Towers as a spectacular backdrop. Could this be a return of the Towers as a live music venue? A number of concerts were held at the park in the 1980's and 90's and now P!nk will follow in the footsteps of artists such as Chris de Burgh, Tina Turner and Wet Wet Wet. Tickets will go on sale at 10am on Monday 9th November priced at £45.00 + booking fee and are available from the usual suppliers. Also special concert, park & hotel packages will be available to book direct with Alton Towers.